The periodic table of elements is an organized—you guessed it—table arranging elements in increasing order of atomic number (and coincidentally, atomic mass). It is “periodic” in nature because it follows a cyclical or rhythmic pattern of trends, which help to explain the basis of chemical behavior of elements and the driving force of reactions. Think of the periodic table as the “Di Vinci Code” of chemistry. It all lines up perfectly to form columns and rows of elements that have many common traits! Each element is listed in its unique “block” on the periodic table. Elements have a one or two letter symbol, typically the first letter or first two letters of their names. But some elements’ symbols are based on their Latin names. Notice below, aluminum’s symbol uses the first two letters: Al. The first letter is always capitalized; the second is not. 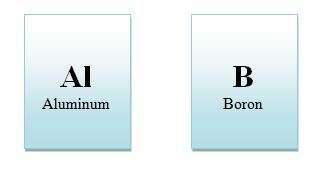 Boron also follows the pattern of using part of the element’s name in its symbol. Single letter element symbols are always capitalized. But potassium uses its Latin name, kalium, in its symbol of K.
Numbering: Groups are numbered from I-VIII with an “A” notation for tall columns and a “B” notation is given to shorter columns called the transition metals. 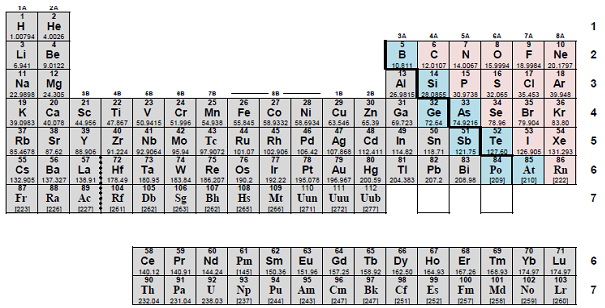 The last two rows separate from the table are called the inner transition metals, individually known as the lanthanides (row 6) and actinides (row 7). Metals and Nonmetals: There is a also a diagonal line of demarcation to separate metals from nonmetals, beginning with No. 5 boron (B) and ending with No. 84 polonium (Po) and No. 85 astatine (At). To left are metals (gray) and to the right are nonmetals (pink). Elements falling along that line are called metalloids (blue), which possess both metallic and nonmetallic properties. Why is the two columns disconnected from the periodic table?